All hours night clubs, warm summer evenings, and long Adriatic beaches are a potent combination. Throw in high octane musical entertainment and the cake is baked. 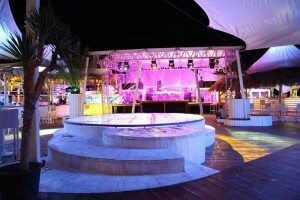 The Noa Beach Club at Zr?e on the island of Pag is just such a place; owners Ivan Joki? and Zlatko Balaško have worked hard to make the club stand out amongst the many others clamouring for attention along the northern Croatian coastline. "Noa is quite young, 2013 is our third year. What we have learned is that there is no substitute for good sound when you're trying to attract international status DJs." Joki? and Balaško approached Tomislav Koran (informally known as Kuki) from Sunflower, a well-known audio dealer based in Rijeka, one hundred kilometres west of Zagreb, on the coast. "They had taken advice from several sources and had a good idea of what they needed to achieve. This is a typical outdoor club; for me it was a matter of assessing the location and then selecting the correct loudspeaker system from the many alternatives within the d&b audiotechnik range, who we represent, to match what Ivan and Zlatko were looking for." The system is centred on d&b C3 loudspeakers, a surprising choice for a beach location, the C3 being a line array module for the d&b C4 point source system. "The Noa Club's needs were unusual in that respect," said Koran. "Firing out to sea made noise pollution in one direction a non-issue, but the clubs on Pag island beach rub shoulders, so the horizontal pattern needed to be tight, 35 degrees in this instance, but still deliver plenty of power. Consider too the vertical five degree parameter of the C3 and suddenly with two high stacks you have a well-defined sound field." Joki? agreed: "It's almost like the club had walls; step out of the field and you can converse without shouting." For renowned DJs Sven Vath and Richie Hawtin the system works well, the addition of small stacks of d&b T10s for monitoring allows them to hear a power and fidelity delivery system matched to the mains PA. As for that low end so necessary for a high reputation club? "We provided d&b B4 subwoofers on rental last summer," concluded Koran. "In this environment the cardioid pattern complements the C3 perfectly. I expect them to become a permanent install this year."